Part 4: A Commonwealth Coming Together or Growing Apart? We shed light on the diversities of circumstances and outcomes that exist in today’s Virginia. 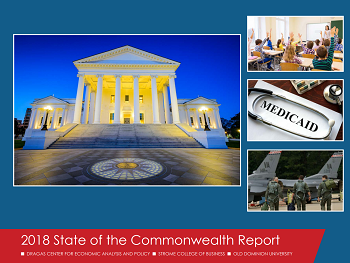 The distributions of income and wealth in the Commonwealth provide important information about the extent to which Virginians share an economic destiny. Center for Economic Analysis and Policy, Old Dominion University, "Part 4: A Commonwealth Coming Together or Growing Apart?" (2018). State of the Commonwealth Reports. 31.